A creamy and tart cheesecake dessert that combines the zing of fresh lemons and sweetened cream cheese. If you love the tangy citrus flavor of lemon, this dessert is for you. Celebrate summer’s arrival with a citrusy lemon dessert that is sure to be a hit for your next summer party. Lemons deserve the spotlight this summer because of their wonderful citrus flavor that can enhance an otherwise ordinary dessert and take it to the next level. Next week I’ll be visiting family back home. I wanted to get together with a few friends and host a barbecue before leaving for a few weeks. Luckily, a friend brought me a bag full of lemons from her tree and I just knew I had to make mini cheesecakes to celebrate the occasion. I always find myself making lighter desserts this time of year. I don’t like to bake desserts that are too heavy and I find these mini cheesecakes sublime during the hottest day of the month. 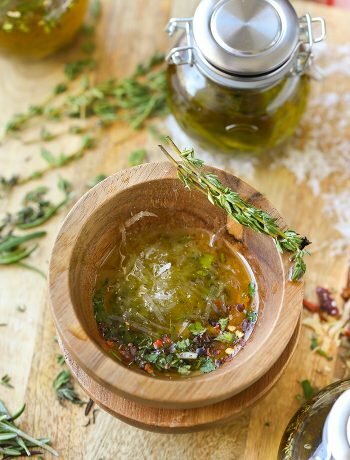 I’ve been on a quest to adapt my favorite recipes by replacing sugar with SPLENDA® Naturals Sugar & Stevia Sweetener Blend and find that it is incredibly simple to work with and the end result is always satisfying. For this recipe, the sugar blend sweetens these lemon cheesecake cupcakes with less added sugar while keeping the taste the same. Each two-pound bag comes with a conversion chart and tips on how to appropriately use the product. What I love most about this product is the taste. 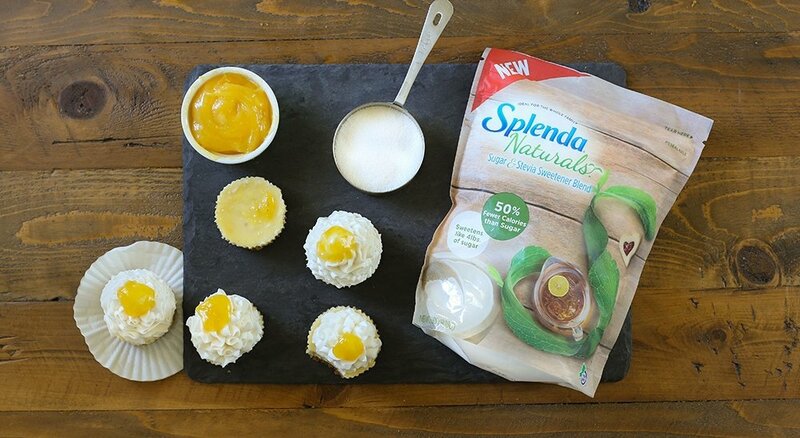 I’ve already swapped out sugar and have started to use SPLENDA® Naturals Sugar & Stevia Sweetener Blend in iced tea, cakes, muffins, sweet bread, and sauces. Baking with this sugar blend is pretty straight forward and rewarding. This particular sugar blend comes in granules that are comparable in size to granulated sugar. While the granules remain the same size, only half of the amount of this sugar blend is needed to achieve the same sweetness as desired with traditional sugar. Create a lasting impression at your next summer party with this tangy lemon dessert. This is the real deal and everything you’d imagine a cheesecake to be. 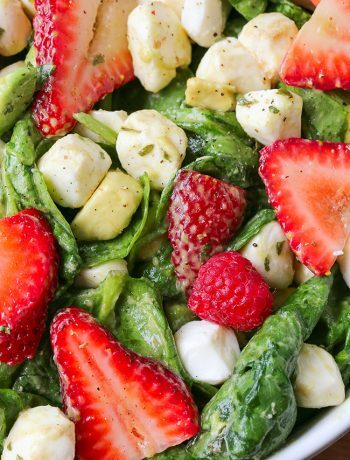 What are some of your favorite #SPLENDASweeties and #SweetSwaps summer desserts to make for a crowd? A creamy and tart cheesecake dessert that combines the zing of fresh lemons and sweetened cream cheese. The perfect dessert to serve at a summer party. Made with less added sugar than the typical cheesecake. Preheat oven to 350 degrees F. Line 9 muffin tin slots with cupcake liners. To make the crust, melt butter in microwave in a small bowl. In a medium bowl, mix melted butter, graham cracker crumbs, and SPLENDA® Naturals Sugar & Stevia Sweetener Blend. Fill each cupcake liner with 2 tablespoons graham cracker crumbs then press mixture into the liners using fingertips. To make the cheesecake, cream the cream cheese until smooth. Beat in SPLENDA® and mix until smooth. Beat in lemon zest and fresh lemon juice and vanilla extract. Carefully beat in egg and egg yolk and mix until well combined. Fill each line nearly to the top. Bake in oven for 22 minutes. Allow to cool for 2 hours before refrigerating for at least 3 hours. To make the topping, beat cream until soft peaks form. Beat in SPLENDA® then frost cupcakes. Top with lemon curd. *To bring eggs to room temperature, place in bowl with warm water for about 5 minutes. **Use store bought whipped cream if desired. Simply skip frosting altogether and top with lemon curd, if desired. I don’t know what it is, but bite sized desserts are so much more fun than full-sized ones. This sounds like a great recipe. I’m with you – lighter desserts are best in the summer on those extra hot days. 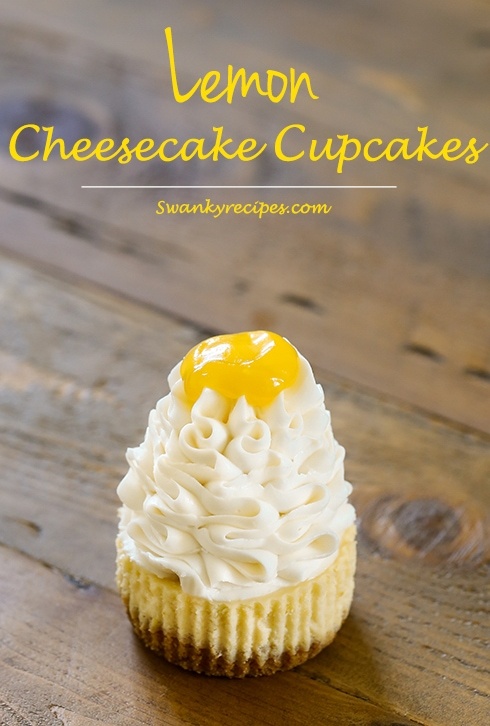 These cupcakes are so lovely – and lemon is my favorite! 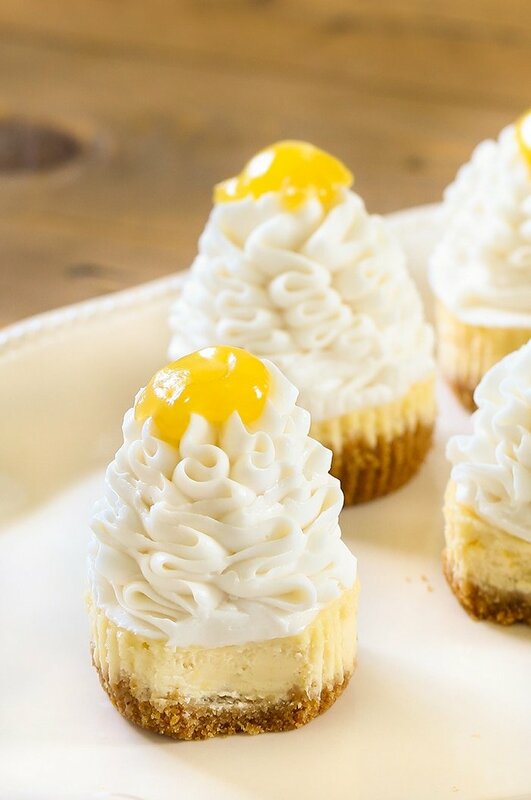 This Lemon Cheesecake Cupcakes look amazing so elegant and tasty. I wish I had one now. Your presentation is lovely too. 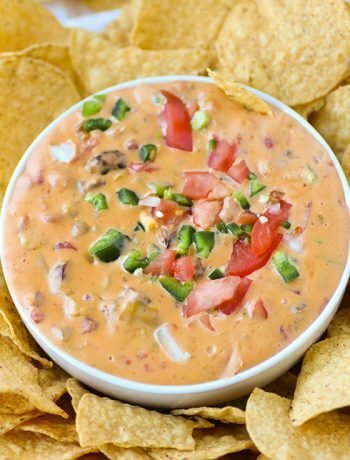 So appetizing and perfect for a party. I LOVE any thing lemon and that lemon curd on the top is screaming my name. Love that you made these sugar free.. Sounds so yum. What a cheesecake? My kiddos and siblings will love to eat that… combination of lemon and cheese. It’s delicious. Thank you for your recipe. I’m all for using less sugar and eating lighter desserts. I don’t eat a lot of desserts — fruit is my sweet — but the lemon in this cheesecake is very tempting. I love what you’ve done crowning the dessert — very pretty. Oh these look gorgeous!! I’d love to reach in and grab one. Beautiful photos! 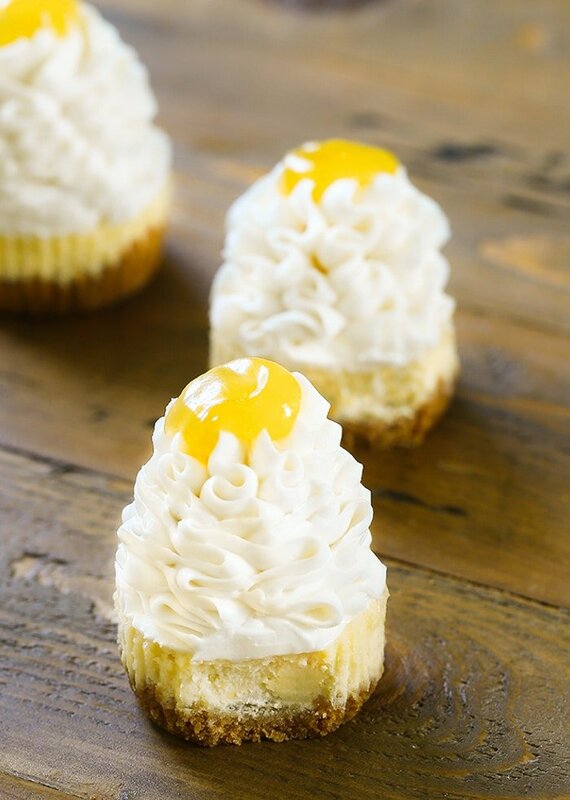 These Lemon Cheesecake Cupcakes are so beautiful. They are perfect for this summer season. These are gorgeous! I love anything with lemon! I will definitely be trying these out! These look like they are to die for. I love the way you piled the whip cream on top. now that’s a lemon dessert I could eat all by myself … the whole kit and kaboodle! Thanks for sharing this with us!